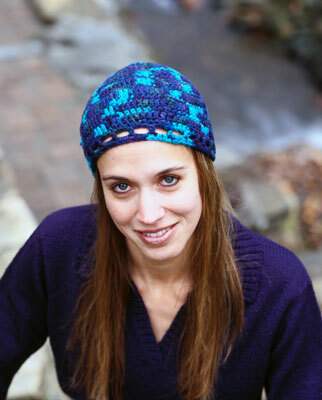 The crochet pattern for this versatile cloche hat incorporates both single crochet and double crochet stitches. Making this cloche hat allows you to practice increasing and decreasing in rounds and to see how shaping occurs. Size: One size fits most adults; circumference = 21 in. Center ring: Ch 4 and close into a ring with 1 sl st in first ch. Rnd 1: Ch 3 (counts as first dc), work 7 dc in ring, sl st in top of ch-3 to join (8 dc). Rnd 2: Ch 1, 2 sc in top of ch-3, 2 sc in each rem dc around, sl st in first sc to join (16 sc). Rnd 3: Ch 3 (counts as first dc), 2 dc in next dc, dc in next sc, 2 dc in next sc , rep from to around, sl st in top of ch-3 to join (24 dc). Rnd 4: Ch 1, sc in top of ch-3, sc in next dc, 2 sc in next dc, sc in each of next 2 dc, 2 sc in next dc , rep from to around, sl st in first sc to join (32 sc). Rnd 5: Ch 3 (counts as first dc), dc in each of next 2 sc, 2 dc in next sc, dc in each of next 3 sc, 2 dc in next sc , rep from to around, sl st in top of ch-3 to join (40 dc). Rnd 6: Ch 1, sc in top of ch-3, sc in each of next 3 dc, 2 sc in next dc, sc in each of next 4 dc, 2 sc in next dc , rep from to around, sl st in first sc to join (48 sc). Rnd 7: Ch 3 (counts as first dc), dc in each of next 4 sc, 2 dc in next sc, dc in each of next 5 sc, 2 dc in next sc , rep from to around, sl st in top of ch-3 to join (56 dc). Rnd 8: Ch 1, sc in top of ch-3, sc in each of next 5 dc, 2 sc in next dc, sc in each of next 6 dc, 2 sc in next dc , rep from to around, sl st in first sc to join (64 sc). Rnd 9: Ch 3 (counts as first dc), dc in each of next 6 sc, 2 dc in next sc, dc in each of next 7 sc, 2 dc in next sc , rep from to around, sl st in top of ch-3 to join (72 dc). Rnd 10: Ch 1, sc in top of ch-3, sc in each of next 7 dc, 2 sc in next dc, sc in each of next 8 dc, 2 sc in next dc , rep from to around, sl st in first sc to join (80 sc). Rnd 11: Ch 3 (counts as first dc), dc in each of next 8 sc, 2 dc in next sc, dc in each of next 9 sc, 2 dc in next sc , rep from to around, sl st in top of ch-3 to join (88 dc). Rnd 12: Ch 1, sc in top of ch-3, sc in each rem dc around, sl st in first sc to join (88 sc). Rnd 13: Ch 3 (counts as first dc), dc in each sc around, sl st in top of ch-3 to join (88 dc). Rnd 14: Ch 1, sc in top of ch-3, sc in each of next 8 dc, dec 1 sc in next 2 dc, sc in each of next 9 dc, dec 1 sc in next 2 dc , rep from to around, sl st in first sc to join (80 sc). Rnd 15: Ch 3 (counts as first dc), dc in each sc around, sl st in top of ch-3 to join (80 dc). Rnd 16: Ch 1, sc in top of ch-3, sc in each of next 7 dc, dec 1 sc in next 2 dc, sc in each of next 8 dc, dec 1 sc in next 2 dc , rep from to around, sl st in first sc to join (72 sc). Rnd 17: Ch 3 (counts as first dc), dc in each rem sc around, sl st in top of ch-3 to join (72 dc). Rnd 18: Ch 1, sc in top of ch-3, sc in each rem dc around, sl st in first sc to join (72 sc). Rnd 19: Ch 3 (counts as first dc), ch 2, skip next 2 sc, dc in next sc, ch 2, skip next 2 sc , rep from to around, sl st in top of ch-3 to join (24 ch-2 spaces). Rnd 20: Ch 1, sc in top of ch-3, 2 sc in next ch-2 space, sc in next dc, 2 sc in next ch-2 space , rep from to around (72 sc). Fasten off.